That may be true in some regards. When it comes to branding a business, however, the chosen name certainly matters. That’s especially true with a professional sports franchise. The team name, in some way or another, should be evocative and dynamic or at least symbolic. When the National Hockey League awarded a conditional expansion franchise on Feb. 9, 1966 to a Philadelphia-based group of bidders (Philadelphia Hockey Club, Inc.) eventually led by Ed Snider, the new team did not yet have a name. In the months that followed, the organization pondered a variety of names; none of which quite conveyed what Snider and his business partners wanted. The internally proposed names, according to Jay Greenberg’s landmark Full Spectrum, included Sabers (the Buffalo Sabres franchise was not created until 1970), Lancers, Raiders, Royals, Knights, Bashers, Bruisers, Blizzards, Icecaps, Huskies, Keystones and Liberty Bells. One night in the spring of 1966, Ed Snider, his wife, his sister Phyllis and her husband Earl Foreman (who was one of the original part-owners of the team) spent an evening in Manhattan to have dinner and see a Broadway show. According to Full Spectrum, on the way back from the play, they decided to stop for some dessert at a Howard Johnson’s restaurant on the New Jersey Turnpike. As they conversed over ice cream, Phyllis suggested a potential team: Flyers. The others, especially her brother, instantly took to the name. All at once, it conveyed the speed of the sport and symbolically represented a single-minded focus on soaring about the competition. Additionally, it was short enough to fit in newspaper headlines without being abbreviated. The name was not entirely unique to the sport. There had been a minor league hockey team called the Edmonton Flyers, multiple junior teams by that name, dozens of semi-pro and independent teams and even a Scotland-based team called the Fife Flyers in the United Kingdom’s primary league. The most famous and successful of the teams was the Niagara Falls Flyers of the Ontario Hockey Association. Coincidentally, numerous players who went on to their greatest fame with Philadelphia’s NHL team previously played their junior hockey for the Niagara Falls Flyers. Originally a Boston Bruins-sponsored junior club, the team’s alumni included Bernie Parent, Doug Favell and Gary Dornhoefer. Other members of the original NF Flyers who later had notable careers with the Philadelphia Flyers included Terry Crisp and Phil Myre. However, neither the Niagara Falls team nor any of the other teams by that name had been the inspiration for the Philadelphia franchise. It was not something researched. It was just a spontaneous suggestion that felt right. Although the name was already picked, management needed to find a good way to publicize it. The solution: A “name the team” contest open to the public, with a grand prize to the winner. The contest winners were chosen among entrants who suggested Flyers or Fliers. The contest, co-sponsored by Acme grocery stores, ran for 10 days in July. On August 3, 1966, at an outdoor press conference held at the construction site at Broad St. and Pattison Ave. that eventually became the Spectrum, both the new team name and the contest winner were announced. The winner: nine-year-old Alec Stockard, a native of Narberth, PA who submitted an entry with Fliers as his suggested name. Among the other entries, according to Full Spectrum, it was actually Liberty Bells (already considered and rejected by team ownership) that got the most votes along with Quakers (the name of a previous, short-lived 1930s NHL team in Philadelphia). Others suggested the names of defunct minor league teams from Philadelphia, such as the Ramblers and Arrows. 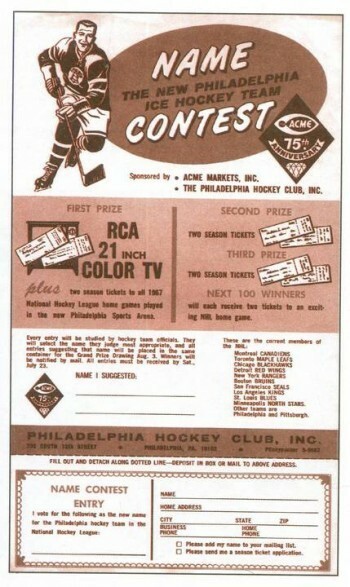 Among the more whimsical entries were suggestions of various entrants’ own names, the Acmes (since the entry forms were obtained at Acme markets), the Philly-Billies, the Scars and Stripes and even the Croaking Crickets. The team had a name, and now it needed a memorable logo. Hiring local firm Mel Richman, Inc., Tom Paul headed the projected and the logo itself was designed by Sam Ciccone. According to some accounts of the story, a man named Richard DeFeo also had a hand in the logo design process at some point. The Flyers prominent use of orange has its roots in the University of Texas Longhorns. Bill Putnam, who was part of the original ownership group, was a UT graduate and a diehard Longhorn fan. Finding the color to be distinctive along with the black and white that became part of the brand, the Sniders also liked the color scheme. Years later, Ed Snider said that if he had known that the late, unlamented Philadelphia Quakers – one of the most disastrous NHL franchises – had previously used orange and black as their color scheme, he’d have steered away from it. Instead, the new franchise just went with what felt right to them. It worked. Fifty years later, the name, the logo and, more or less, the uniform are the same.